At the time of her birth in 1885, Mary’s mother, Mary Ann Perkins James, was a Latter-day Saint and her father, Sylvester James, had been. Her siblings were blessed and baptized, but the Salt Lake First Ward Record of Members does not list a blessing for her. Nevertheless, Mary Ann James is listed in Susan Easton Black’s compilation of early members of the LDS Church probably because she was born to a Mormon family. Mary carried the name of her mother and her aunt, Sylvester’s sister. She was the last child born to the James couple. Little Mary died shortly after her third birthday in the winter of 1888. The cause of her death appears to be “inflamed lungs.” She is buried in the Salt Lake City Cemetery. Church of Jesus Christ of Latter-day Saints, Record of Members Collection, Salt Lake 1st Ward. CR 375 8, box 2168, folder 1, image 59. Church History Library, Salt Lake City, Utah. Utah Department of Health. Bureau of Vital Statistics. Utah Death Index, 1847-1866. Utah State Archives and Records Service. Series 21866. Salt Lake City, Utah. Black, Susan Easton, compiler. Membership of The Church of Jesus Christ of Latter-day Saints, 1830-1848. 50 vols. Provo Utah: Brigham Young University Studies Center, 1989. Salt Lake City, Utah, Cemetery Records, 1848-1992. Mary Ann Child James (1885-1888), at Ancestry.com. Church of Jesus Christ of Latter-day Saints, Record of Members Collection, First Ward, CR 375 8, box 2168, folder 1, image 59, Church History Library, Salt Lake City, Utah. Utah Department of Health, Bureau of Vital Statistics, Utah Death Index, 1847-1866, Salt Lake City, Utah. Salt Lake City, Utah. 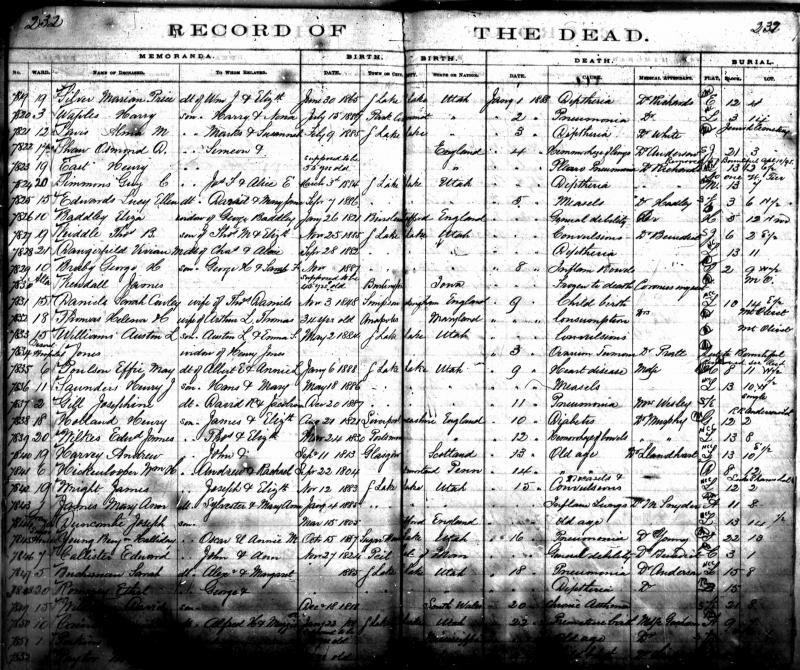 Cemetery Records, 1848-1992. At Ancestry.com.